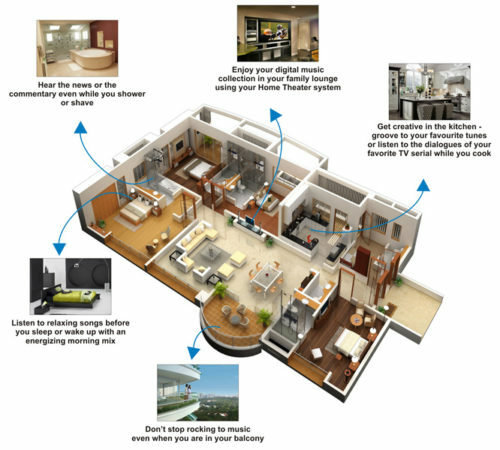 Home music systems by Creative LAVA delivers a complete distributed audio solution that includes high quality in-ceiling, in-wall architectural speakers and outdoor music systems along with control and automation functionality. Stream music from apps like Pandora, iTunes, Amazon Music and dozens of other online music sources to any room of the house by simply using your smartphone. 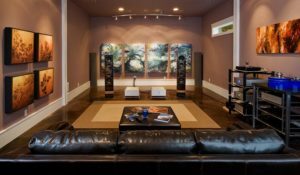 We carry several lines of architectural speakers such as in-wall and in-ceiling speakers, as well as an in-wall subwoofer. In-wall invisible speakers are also available, which completely hide into the wall or ceiling for a completely invisible look. Add music to your backyard and pool area with a complete landscape series speaker system. Traditional outdoor speakers create “hot spots” of sound which sound good when you’re near by but are hard to hear when you’re too far away. Our landscape speaker systems are designed specifically for your backyard to include several small satellite speakers and in-ground subwoofers to create an unparalleled listening experience. services, build out and complete high-end 2-channel music systems from the best amplifier and speaker manufacturers. Isolate the music into the room by using soundproofing methods and materials that we’ve perfected. Enhance the quality of sound with an engineered room using sound panels, sound dampeners and diffusers. Listen to music for the first time with a room and system engineered by the Creative LAVA experts.